Rather than open the cap on the radiator, just check to see whether the liquid reaches the “Full” line on the side of the coolant reservoir shown here. It’s part of the coolant recovery system. If the liquid doesn’t reach the “Full” line, open the bottle and add a 50/50 mix of water and coolant until it does. Some coolants are premixed, so check the bottle to see whether you need to add water or just use it as-is. Check the coolant stored in the plastic bottle connected to the radiator. Only in an emergency should you add only water to the coolant system. Most modern engines have aluminum cylinder heads, which require the protective anticorrosive properties of antifreeze. 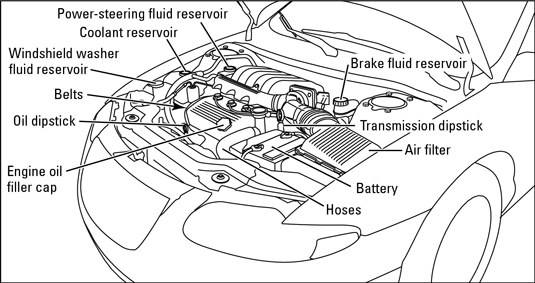 A 50/50 mix of liquid or coolant is usually sufficient. Some coolant recovery systems are pressurized and have a radiator pressure cap instead of a normal cap. 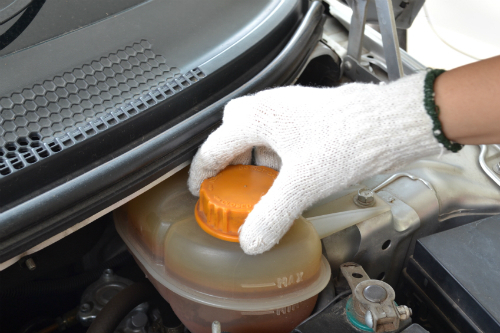 Some older vehicles have no coolant reservoir, so to check and add coolant, you have to open the cap on the radiator. Never add coolant to a hot engine! If you need to add more liquid, wait until the engine has cooled down to avoid the possibility of being burned or cracking your engine block. Don’t open the caps on either of these systems when the engine is hot; if you do, hot coolant may be ejected. Coolant is usually red, green, blue, or yellow. If it looks colorless, looks rusty, or has things floating around in it, flush your cooling system and add new coolant. If the coolant has a sludgy, oily surface, immediately take the vehicle to your mechanic to check for internal head gasket leakage. The service facility has special equipment for performing this check. While you’re messing around with your cooling system, feel the radiator hoses, too. They’re the big hoses that go into the top and come out of the bottom of the radiator. If they’re leaking, cracked, bulgy, or squishy, they should be replaced.